Aluminum wheels, though challenging maintenance-wise, are an absolute charm if well-polished. Attractive and shiny, they make any car look loved and cared for. Below is an easy to follow, step by step guide on how to polish aluminum wheels to achieve that glamorous sheen you earnestly crave. Step 1: Remove Cleaning Hindrances. Step 2: Clean The Wheel Thoroughly. Step 3: Get Rid Of pit Marks And Curb Rash. Step 5: Apply Polishing Agent. Step 6: Polish With Microfiber Cloth. To polish aluminum truck wheels or any other type of aluminum wheels with minimal hassle, necessary preparations are in order. First, devise a comfortable working station since wheel buffing is time-consuming. ​Aluminum Brightener and a polishing agent (paste or liquid). Dismount the wheels for easy access. In This 6 step guide i will discuss the easiest way to polish aluminum. Get rid of anything that may compromise the cleaning procedure including stickers, valve stems, wheel weights, center caps, etc. However, be careful about it to avoid compromising the structural integrity of the wheel. 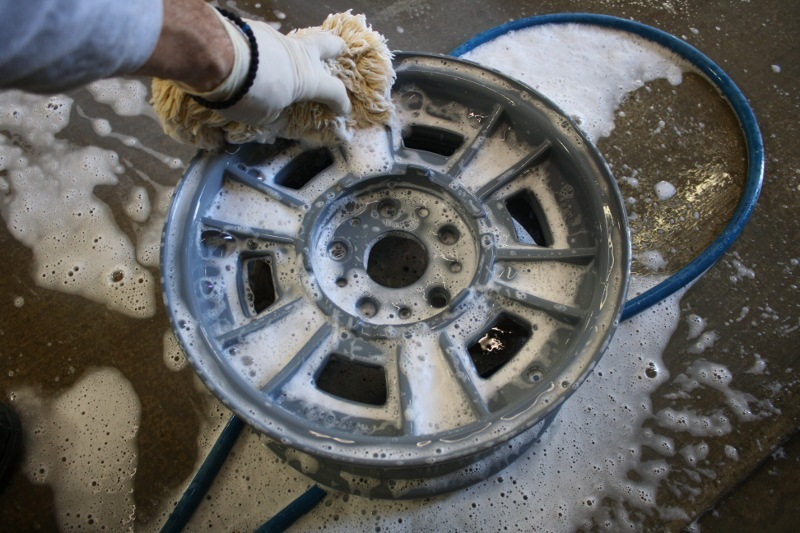 Use the scouring pad and your preferred soap to comprehensively clean the wheel. Be utterly thorough and do not spare a single inch. After scrubbing, rinse out the wheel with pressurized water.If your wheel had a clear coat, stop right here to avoid damaging it. If the grime is unyielding, use an oven cleaner: just apply it and leave to rest for 10-20 minutes and then rinse. With graceful strokes, utilize the flat file to gingerly even out curb spots to the point of invisibility. Ideally, use a smooth, or dead smooth file to achieve a neat finish. For pit marks, employ the sand paper and rub in a similar direction. Commence with the smooth grit paper (600 grit) and graduate to rougher grits for deeper indentations. Finish off all problem areas with a smooth grit sandpaper to iron out all abrasions. Then, rinse and dry the wheel with one of the towels. Being careful to hit all the spots, liberally smear aluminum brightening cleaner to mitigate oxidation and restore the wheel’s luster. Once done, lightly wipe with a lint-free towel or cloth. In a gentle manner, smear your preferred polishing﻿﻿﻿ agent and make sure you hit all the spots. Preferably, rub in one direction and focus on one area at a time to get a consistent shine. Unhurriedly polish and buff with a microfiber cloth to a mirror finish. And that is it – job done. The above process offers the easiest way﻿﻿ to polish aluminum wheels to an elegant finish. Whenever the wheels become cloudy again, simply repeat the process.